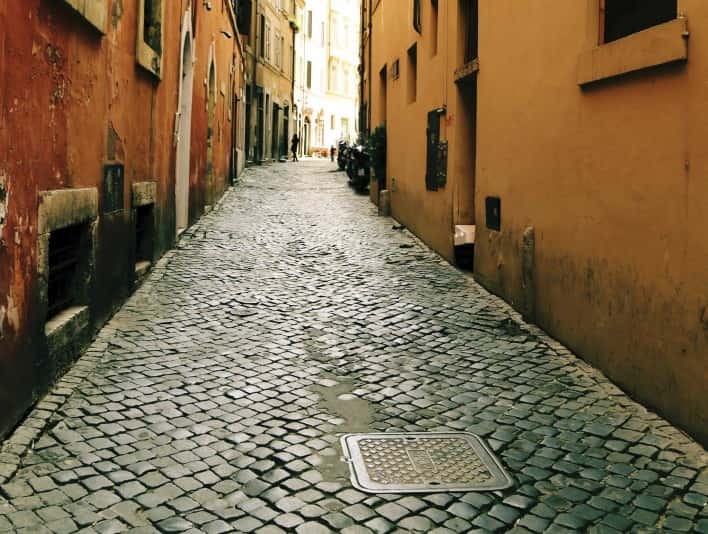 This is a colour photo of an alley way in Rome Italy, the SPQR manhole cover embedded into the alley way’s cobble stone path reveals the photo’s location and creator, the Fonderia Romana. The buildings tower over either side of the alley in bright umber and amber tones, at the end of the alley a burts of sublight breaks through the buildings creatings incredible contrast. A lone woman having a converstion on her cellphone can be seen in the far distance, a child can also be seen running. A set of motorcycles lines the side of the alleyway. The cobble stones are square in shape but are oriented such that they appear to be diamond shape.